I was recently invited by the lovely Alison from passionsandpreening to attend a Lush blogger event as her plus one. I love Lush products and always stock up on them when I'm in Belfast so I was chuffed to be going. After everyone had arrived and had their photo taken, we were all asked to gather around and told what would be happening throughout the night and asked to take a seat... We then were shown some products, told how to use them and given them to try/smell/feel for ourselves. There was an opportunity to ask questions and it was all very nice and relaxed. After we had seen all the products we were invited to take part in making our own product (Angels on bare skin). I didn't want to mix it so I simply potted my own little tub. I don't really like getting my hands all yucky lol. Then on to the reason we were all there..... The reveal of Lush's Fathers day range... All night the products had been covered by a large piece of fabric, everyone had gathered around and we were all standing in anticipation of what was behind it, after a count down from 5... All was revealed!! What could be under here?? The staff then took us threw each product, passed them around for us all to smell and told us the ingredients used in making the item. We were also given a demonstration of a bath bomb, bubble bar and slow fizzer in action. Again we had the chance to ask questions/prices of products etc... then we got the chance to buy anything we wanted before the evening was wrapped up. On leaving we were all given a very generous goody bag containing a mix of different products. Inside my bag their was a mix of bath bombs, bubble bars, body scrubs, bath fizzers, solid perfume and a lip balm!! We were definitely spoiled by the lovely people at Lush! If you would like to check out the full fathers day range or check out any of the ingredients in any of the products you can find all information online at Lush. Hope you enjoyed reading all about my time at the Lush event. If you want to see more pictures pop over to my facebook. A couple of months ago I was very kindly sent out some products from Belfast Soap Company to try out. I had seen this company about but had never tried any of their products. When I looked into The Belfast Soap Company it became clear exactly what they were about and what they stand for. The Company was actually set up to try and combat the liquid soap in a bottle and have it in a natural bar form instead, reducing in waste and also helping the earth. In each bar of soap/shampoo only natural ingredients are used such as Coconut oil, Olive oil, Shea butter, Castor oil, charcoal, Herbs , flowers, clays and spices: Such as lemongrass, St Johns Wort, paprika, cinnamon, calendula petals. -No animal testing - tested on owners, not animals. They really do take the earth and environment into consideration in every aspect of their business. So onto testing the products! I decided to use the products for a couple of months to really give an honest and valid review. I had been sent out 3 products. One bar of grapefruit shampoo and two bar's of soap in lavender & lemon and also spearmint. I used the lavender & lemon soap first and found it gave a really good lather and the smell was beautiful, so fresh and clean. The soap left my hands feeling really moisturized and soft. I then moved onto the spearmint soap bar after a couple of weeks and this is my favorite out of the 3 products, It smells just like spearmint softmints :) the smell is soo powerful and strong, you can smell it on your hands for ages! I am not a fan of shampoo bars as I have such long thick hair I can never get enough product or lather from them. I find they always leave my hair feeling dirty and straw like, however I did give this a go and as I was expecting I didn't like it, don't get me wrong the shampoo smells lovely, but just not a product I would go for. The smell you get from The Belfast Soap Company products is fantastic, as soon as you walk into the bathroom all you can smell is the soap bars. Its just an extra bonus that everything used in making the product is natural. The Belfast soap company really do value their customers, not only did they include a voucher for money off my next purchase, they also included a cute little packet of Haribo sweets in the parcel. This extra little touch would make you want to purchase from them again. If you are looking for a present for someone or for a little treat for yourself, I would recommend checking out The Belfast Soap Company. Soo.... the main question! Was I impressed and would I purchase more items from the company ... The answer... Yes I definitely would! If you want to check all the products available and prices you can pop over to their website www.belfastsoapcompany.co.uk or you can check them out on facebook or twitter. Thanks again for taking the time to read my blog and as I have said before I'm sorry I haven't put more posts up, I am one busy little bee atm! But if you want to check out my other social media to see what I get up to you can find me on Instagram, twitter or facebook. Its been a while since I last checked in with you all ... How are we all keeping? Good I hope. 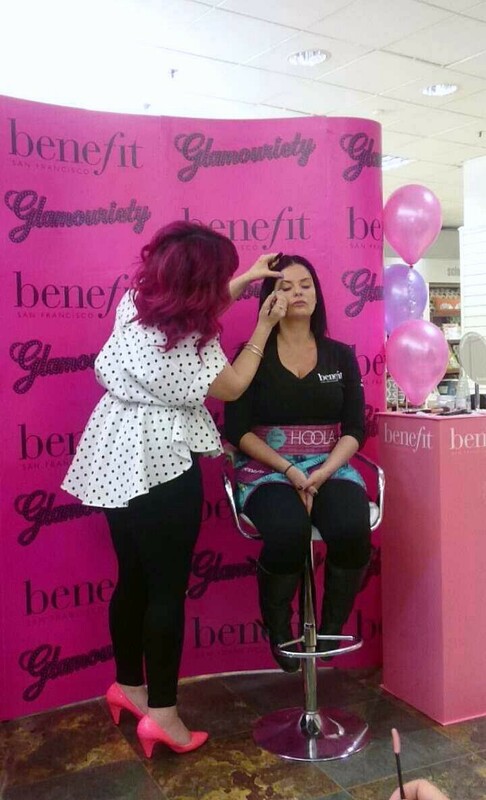 So about 2 weeks ago I got tagged on facebook on a post on Moores of Coleraine page to a Benefit Masterclass happening on Thursday 28th April in Moore's where Amy Lou Faulkner (Benefit MUA) would be giving live Demos and reveling some make up secrets. When we arrived we were showed up to the cafe area where all the Benefit girls and Amy Lou were setting up. There was drinks and nibbles and the girls made us feel very welcome. We decided to not take front row seat and opted to sit in the second row. Around 30 people showed up and Amy got started on her Candy Apple Lips demo. Amy Lou talked us threw all the different products she was using and each product was passed around everyone so they could try it out on the back of their hand. I thought this was really good as its nice to feel the texture and consistency of the products before purchasing. You could ask questions at any time throughout the demo and Amy was very good at explaining everything she used on the model. The Demo lasted about 40 minutes and after we went down to the Benefit stand on the ground floor where you could try all the products, get advice, shade matching and buy anything you wanted. I had been looking at the hello flawless oxygen wow foundation for some time and got shade matched by Michelle from Belfast Benefit, who was down helping on the night. I really liked the feel of the foundation on my skin and decided to go for it. I also had seen Amy Lou used the Bene tint and decided to go for the purple shade.... Lolli tint. 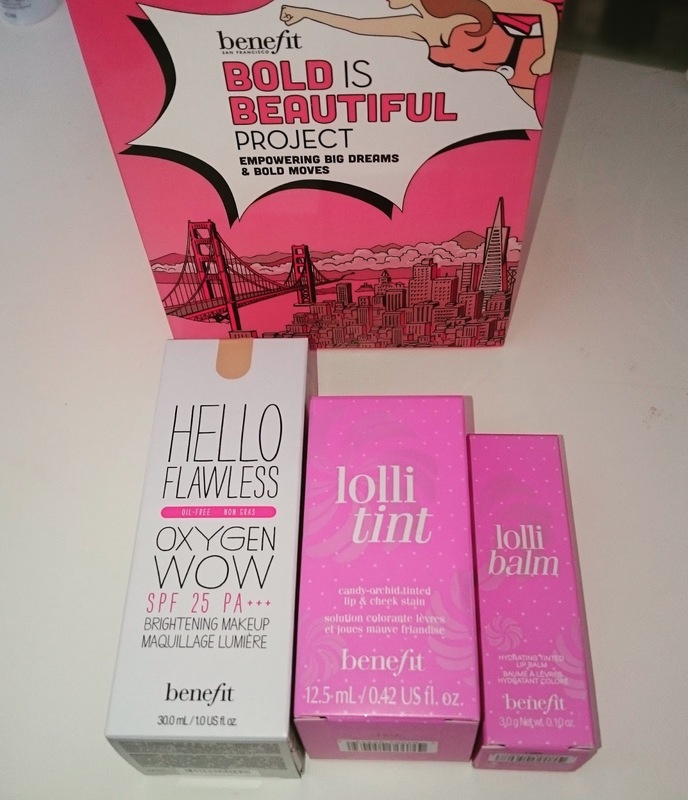 I also treated myself to the lolli balm to accompany the tint. I have to say how lovely and helpful Michelle was, I sometimes feel awkward and intimidated around some of the sales girls but honestly Michelle's costumer service was outstanding, she put me at ease and made picking what items I wanted soo easy. Everyone who attended the event got a free goodie bag which included samples of products and a lovely Benefit passport cover. I really enjoyed the event and was very lucky to be able to attend as Belfast and Coleraine were the only two places Amy Lou visited to do her masterclass in Northern Ireland! I really hope Moores hold more masterclasses like this one as I had a really enjoyable evening and learnt so many tips and tricks!